Preheat oven to 220°C (425°F). Place the eggplant slices on 2 large oven trays. Sprinkle each side with the salt and set aside for 20 minutes. While the eggplant is being salted, place the flour, salt and pepper in a medium bowl and mix to combine. Place the eggs and milk in a separate medium bowl and whisk to combine. Place the breadcrumbs, lemon rind, oregano, parsley, garlic, chilli, salt and pepper in a separate largebowl and toss to combine. Using paper towel, wipe off the excess salt from the eggplant. Dust with the flour mixture, dip into the egg mixture and press into the crumb mixture to coat. Heat 3cm of oil in a large frying pan over medium heat. Cook the eggplant, in batches, turning halfway, for 4–6 minutes or until golden. Place on a large oven tray and cook in the oven for 10 minutes or until tender. To make the creamy mash, place the potato in a large saucepan of salted cold water over high heat and bring to the boil. Cook for 15−20 minutes or until tender. Drain and return to the saucepan. Add the butter, milk, salt and pepper and mash until smooth. Place the butter in a small frying pan over high heat and cook for 4–6 minutes or until nut brown. 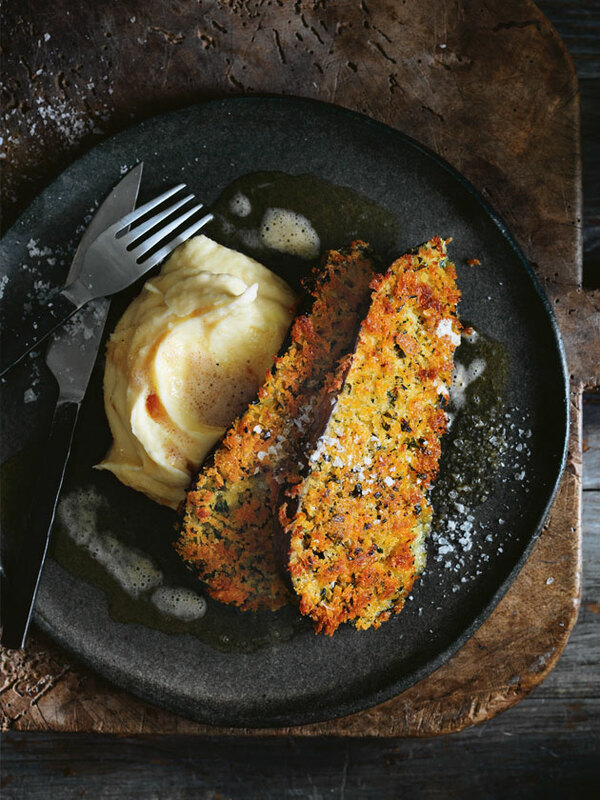 Serve the schnitzels with the creamy mash and burnt butter. Serves 4. YUM! Hubby loved these - delicious and crunchy. Will definitely make these again.